"Wagner" redirects here. For others with the surname, see Wagner (surname). For other uses, see Wagner (disambiguation) and Richard Wagner (disambiguation). 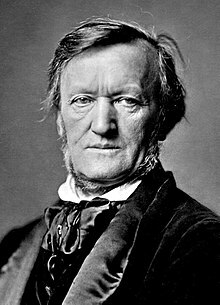 Wilhelm Richard Wagner (/ˈvɑːɡnər/; German: [ˈʁɪçaʁt ˈvaːɡnɐ] ( listen); 22 May 1813 – 13 February 1883) was a German composer, theatre director, polemicist, and conductor who is chiefly known for his operas (or, as some of his later works were later known, "music dramas"). Unlike most opera composers, Wagner wrote both the libretto and the music for each of his stage works. Initially establishing his reputation as a composer of works in the romantic vein of Carl Maria von Weber and Giacomo Meyerbeer, Wagner revolutionised opera through his concept of the Gesamtkunstwerk ("total work of art"), by which he sought to synthesise the poetic, visual, musical and dramatic arts, with music subsidiary to drama. He described this vision in a series of essays published between 1849 and 1852. Wagner realised these ideas most fully in the first half of the four-opera cycle Der Ring des Nibelungen (The Ring of the Nibelung). 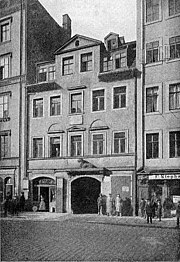 Richard Wagner was born to an ethnic German family in Leipzig, who lived at No 3, the Brühl (The House of the Red and White Lions) in the Jewish quarter. He was baptized at St. Thomas Church. 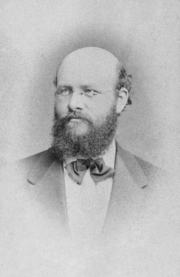 He was the ninth child of Carl Friedrich Wagner, who was a clerk in the Leipzig police service, and his wife, Johanna Rosine (née Paetz), the daughter of a baker. 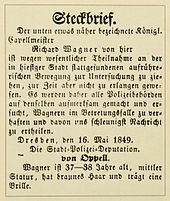 [n 1] Wagner's father Carl died of typhus six months after Richard's birth. Afterwards his mother Johanna lived with Carl's friend, the actor and playwright Ludwig Geyer. In August 1814 Johanna and Geyer probably married—although no documentation of this has been found in the Leipzig church registers. 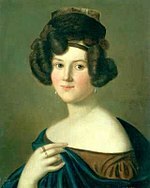 She and her family moved to Geyer's residence in Dresden. Until he was fourteen, Wagner was known as Wilhelm Richard Geyer. He almost certainly thought that Geyer was his biological father. Amongst the conducting engagements that Wagner undertook for revenue during this period, he gave several concerts in 1855 with the Philharmonic Society of London, including one before Queen Victoria. The Queen enjoyed his Tannhäuser overture and spoke with Wagner after the concert, writing of him in her diary that he was "short, very quiet, wears spectacles & has a very finely-developed forehead, a hooked nose & projecting chin." In 1871, Wagner decided to move to Bayreuth, which was to be the location of his new opera house. The town council donated a large plot of land—the "Green Hill"—as a site for the theatre. The Wagners moved to the town the following year, and the foundation stone for the Bayreuth Festspielhaus ("Festival Theatre") was laid. 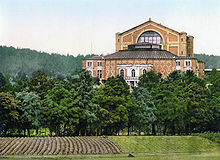 Wagner initially announced the first Bayreuth Festival, at which for the first time the Ring cycle would be presented complete, for 1873, but since Ludwig had declined to finance the project, the start of building was delayed and the proposed date for the festival was deferred. To raise funds for the construction, "Wagner societies" were formed in several cities, and Wagner began touring Germany conducting concerts. By the spring of 1873, only a third of the required funds had been raised; further pleas to Ludwig were initially ignored, but early in 1874, with the project on the verge of collapse, the King relented and provided a loan. [n 12] The full building programme included the family home, "Wahnfried", into which Wagner, with Cosima and the children, moved from their temporary accommodation on 18 April 1874. The theatre was completed in 1875, and the festival scheduled for the following year. Commenting on the struggle to finish the building, Wagner remarked to Cosima: "Each stone is red with my blood and yours". Wagner's musical output is listed by the Wagner-Werk-Verzeichnis (WWV) as comprising 113 works, including fragments and projects. The first complete scholarly edition of his musical works in print was commenced in 1970 under the aegis of the Bavarian Academy of Fine Arts and the Akademie der Wissenschaften und der Literatur of Mainz, and is presently under the editorship of Egon Voss. It will consist of 21 volumes (57 books) of music and 10 volumes (13 books) of relevant documents and texts. As at October 2017, three volumes remain to be published. The publisher is Schott Music. From 1849 onwards, he urged a new concept of opera often referred to as "music drama" (although he later rejected this term),[n 13] in which all musical, poetic and dramatic elements were to be fused together—the Gesamtkunstwerk. Wagner developed a compositional style in which the importance of the orchestra is equal to that of the singers. The orchestra's dramatic role in the later operas includes the use of leitmotifs, musical phrases that can be interpreted as announcing specific characters, locales, and plot elements; their complex interweaving and evolution illuminates the progression of the drama. These operas are still, despite Wagner's reservations, referred to by many writers as "music dramas". Wagner's earliest attempts at opera were often uncompleted. 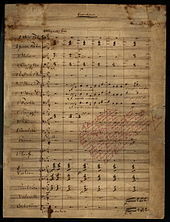 Abandoned works include a pastoral opera based on Goethe's Die Laune des Verliebten (The Infatuated Lover's Caprice), written at the age of 17, Die Hochzeit (The Wedding), on which Wagner worked in 1832, and the singspiel Männerlist größer als Frauenlist (Men are More Cunning than Women, 1837–38). Die Feen (The Fairies, 1833) was unperformed in the composer's lifetime and Das Liebesverbot (The Ban on Love, 1836) was withdrawn after its first performance. 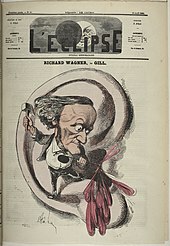 Rienzi (1842) was Wagner's first opera to be successfully staged. The compositional style of these early works was conventional—the relatively more sophisticated Rienzi showing the clear influence of Grand Opera à la Spontini and Meyerbeer—and did not exhibit the innovations that would mark Wagner's place in musical history. Later in life, Wagner said that he did not consider these works to be part of his oeuvre; and they have been performed only rarely in the last hundred years, although the overture to Rienzi is an occasional concert-hall piece. Die Feen, Das Liebesverbot, and Rienzi were performed at both Leipzig and Bayreuth in 2013 to mark the composer's bicentenary. Apart from his operas, Wagner composed relatively few pieces of music. These include a symphony in C major (written at the age of 19), the Faust Overture (the only completed part of an intended symphony on the subject), some concert overtures, and choral and piano pieces. His most commonly performed work that is not an extract from an opera is the Siegfried Idyll for chamber orchestra, which has several motifs in common with the Ring cycle. The Wesendonck Lieder are also often performed, either in the original piano version, or with orchestral accompaniment. [n 17] More rarely performed are the American Centennial March (1876), and Das Liebesmahl der Apostel (The Love Feast of the Apostles), a piece for male choruses and orchestra composed in 1843 for the city of Dresden. 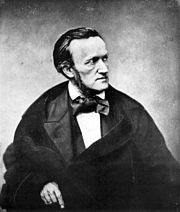 There have been modern complete or partial editions of Wagner's writings, including a centennial edition in German edited by Dieter Borchmeyer (which, however, omitted the essay "Das Judenthum in der Musik" and Mein Leben). The English translations of Wagner's prose in eight volumes by W. Ashton Ellis (1892–99) are still in print and commonly used, despite their deficiencies. The first complete historical and critical edition of Wagner's prose works was launched in 2013 at the Institute for Music Research at the University of Würzburg; this will result in 16 volumes (eight of text and eight of commentary) totalling approximately 5,300 pages. It is anticipated that the project will be completed by 2030. A complete edition of Wagner's correspondence, estimated to amount to between 10,000 and 12,000 items, is under way under the supervision of the University of Würzburg. As of October 2017, 23 volumes have appeared, covering the period to 1873. Wagner made a major contribution to the principles and practice of conducting. His essay "About Conducting" (1869) advanced Hector Berlioz's technique of conducting and claimed that conducting was a means by which a musical work could be re-interpreted, rather than simply a mechanism for achieving orchestral unison. He exemplified this approach in his own conducting, which was significantly more flexible than the disciplined approach of Felix Mendelssohn; in his view this also justified practices that would today be frowned upon, such as the rewriting of scores. [n 18] Wilhelm Furtwängler felt that Wagner and Bülow, through their interpretative approach, inspired a whole new generation of conductors (including Furtwängler himself). The poets Charles Baudelaire, Stéphane Mallarmé and Paul Verlaine worshipped Wagner. 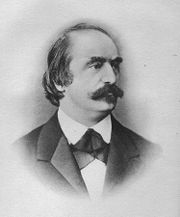 Édouard Dujardin, whose influential novel Les Lauriers sont coupés is in the form of an interior monologue inspired by Wagnerian music, founded a journal dedicated to Wagner, La Revue Wagnérienne, to which J. K. Huysmans and Téodor de Wyzewa contributed. In a list of major cultural figures influenced by Wagner, Bryan Magee includes D. H. Lawrence, Aubrey Beardsley, Romain Rolland, Gérard de Nerval, Pierre-Auguste Renoir, Rainer Maria Rilke and numerous others. In the 20th century, W. H. Auden once called Wagner "perhaps the greatest genius that ever lived", while Thomas Mann and Marcel Proust were heavily influenced by him and discussed Wagner in their novels. He is also discussed in some of the works of James Joyce. 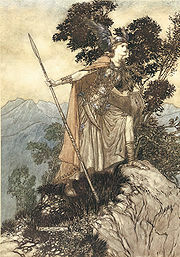 Wagnerian themes inhabit T. S. Eliot's The Waste Land, which contains lines from Tristan und Isolde and Götterdämmerung, and Verlaine's poem on Parsifal. Even those who, like Debussy, opposed Wagner ("this old poisoner") could not deny his influence. Indeed, Debussy was one of many composers, including Tchaikovsky, who felt the need to break with Wagner precisely because his influence was so unmistakable and overwhelming. "Golliwogg's Cakewalk" from Debussy's Children's Corner piano suite contains a deliberately tongue-in-cheek quotation from the opening bars of Tristan. Others who proved resistant to Wagner's operas included Gioachino Rossini, who said "Wagner has wonderful moments, and dreadful quarters of an hour." In the 20th century Wagner's music was parodied by Paul Hindemith[n 19] and Hanns Eisler, among others. Wagner's writings on Jews, including Jewishness in Music, corresponded to some existing trends of thought in Germany during the 19th century; however, despite his very public views on these themes, throughout his life Wagner had Jewish friends, colleagues and supporters. 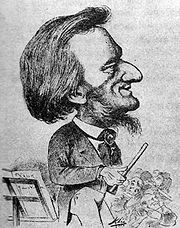 There have been frequent suggestions that antisemitic stereotypes are represented in Wagner's operas. 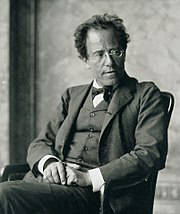 The characters of Mime in the Ring, Sixtus Beckmesser in Die Meistersinger, and Klingsor in Parsifal are sometimes claimed as Jewish representations, though they are not identified as such in the librettos of these operas. [n 20] The topic of Wagner and the Jews is further complicated by allegations, which may have been credited by Wagner, that he himself was of Jewish ancestry, via his supposed father Geyer. [Wagner's] picture of Niblunghome[n 21] under the reign of Alberic is a poetic vision of unregulated industrial capitalism as it was made known in Germany in the middle of the 19th century by Engels's book The Condition of the Working Class in England. Left-wing interpretations of Wagner also inform the writings of Theodor Adorno among other Wagner critics. [n 22] Walter Benjamin gave Wagner as an example of "bourgeois false consciousness", alienating art from its social context. Adolf Hitler was an admirer of Wagner's music and saw in his operas an embodiment of his own vision of the German nation; in a 1922 speech he claimed that Wagner's works glorified "the heroic Teutonic nature ... Greatness lies in the heroic." Hitler visited Bayreuth frequently from 1923 onwards and attended the productions at the theatre. There continues to be debate about the extent to which Wagner's views might have influenced Nazi thinking. [n 23] Houston Stewart Chamberlain (1855–1927), who married Wagner's daughter Eva in 1908 but never met Wagner, was the author of the racist book The Foundations of the Nineteenth Century, approved by the Nazi movement. Chamberlain met Hitler on a number of occasions between 1923 and 1927 in Bayreuth, but cannot credibly be regarded as a conduit of Wagner's own views. The Nazis used those parts of Wagner's thought that were useful for propaganda and ignored or suppressed the rest. ^ Of their children, two (Carl Gustave and Maria Theresia) died as infants. The others were Wagner's brothers Albert and Carl Julius, and his sisters Rosalie, Luise, Clara and Ottilie. Except for Carl Julius becoming a goldsmith, all his siblings developed careers connected with the stage. 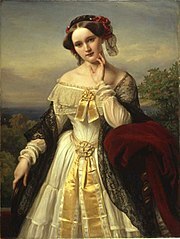 Wagner also had a younger half-sister, Caecilie, born in 1815 to his mother and her second husband Geyer. See also Wagner family tree. ^ This sketch is referred to alternatively as Leubald und Adelaide. 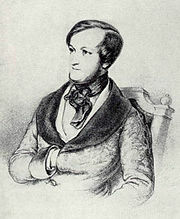 ^ Wagner claimed to have seen Schröder-Devrient in the title role of Fidelio, but it seems more likely that he saw her performance as Romeo in Bellini's I Capuleti e i Montecchi. ^ Röckel and Bakunin failed to escape and endured long terms of imprisonment. ^ Gutman records him as suffering from constipation and shingles. ^ The influence was noted by Nietzsche in his "On the Genealogy of Morality": "[the] fascinating position of Schopenhauer on art ... was apparently the reason Richard Wagner first moved over to Schopenhauer ... That shift was so great that it opened up a complete theoretical contrast between his earlier and his later aesthetic beliefs." ^ For example, the self-renouncing cobbler-poet Hans Sachs in Die Meistersinger von Nürnberg is a "Schopenhauerian" creation; Schopenhauer asserted that goodness and salvation result from renunciation of the world, and turning against and denying one's own will. ^ E.g. "My dearest Beloved! ", "My beloved, my most glorious Friend" and "O Holy One, I worship you". ^ Wagner excused himself in 1878, when discussing this correspondence with Cosima, by saying "The tone wasn't good, but I didn't set it." ^ Wagner claimed to be unable to travel to the funeral due to an "inflamed finger". ^ Cosima's birthday was 24 December, but she usually celebrated it on Christmas Day. ^ In 1873, the King awarded Wagner the Bavarian Maximilian Order for Science and Art; Wagner was enraged that, at the same time, the honour had been given also to Brahms. ^ In his 1872 essay "On the Designation 'Music Drama'", he criticises the term "music drama" suggesting instead the phrase "deeds of music made visible". ^ For the reworking of Der fliegende Holländer, see Deathridge (1982) 13, 25; for that of Tannhäuser, see Millington (2001) 280–2, which further cites Wagner's comment to Cosima three weeks before his death that he "still owes the world Tannhäuser." See also the articles on these operas in Wikipedia. ^ See performance listings by opera in Operabase, and the Wikipedia articles The Flying Dutchman discography, Tannhäuser discography and Lohengrin discography. ^ For example, Der fliegende Holländer (Dutchman) was first performed in London in 1870 and in the US (Philadelphia) in 1876; Tannhäuser in New York in 1859 and in London in 1876; Lohengrin in New York in 1871 and London in 1875. For detailed performance histories including other countries, see Stanford University Wagner site, under each opera. ^ Normally the orchestration by Felix Mottl is used (score available at IMSLP website), although Wagner arranged one of the songs for chamber orchestra. ^ See for example Wagner's proposals for the rescoring of Beethoven's Ninth Symphony in his essay on that work. ^ Weiner (1997) gives very detailed allegations of antisemitism in Wagner's music and characterisations. ^ Shaw's anglicization of Nibelheim, the empire of Alberich in the Ring cycle. ^ See Žižek (2009) viii: "[In this book] for the first time the Marxist reading of a musical work of art ... was combined with the highest musicological analysis." ^ The claim that Hitler, in his maturity, commented that "it [i.e. his political career] all began" after seeing a performance of Rienzi in his youth, has been disproved. ^ See e.g. John (2004) for a detailed essay on music in the Nazi death camps, which nowhere mentions Wagner. See also Potter (2008) 244: "We know from testimonies that concentration camp orchestras played [all sorts of] music ... but that Wagner was explicitly off-limits. However, after the war, unsubstantiated claims that Wagner's music accompanied Jews to their death took on momentum." ^ "Richard". Duden. Retrieved 24 May 2018. ^ Wagner, Richard; Elli, William Ashton (1911). Family Letters of Richard Wagner. p. 154. ^ Wagner (1987) 199. Letter from Richard Wagner to Franz Liszt, 21 April 1850. See also Millington (2001) 282, 285. ^ See Treadwell (2008) 182–90. ^ Wagner (1994c) 391 and n.
^ Wagner (1992) 508–10. Others agree on the profound importance of this work to Wagner – see Magee (2000) 133–4. ^ See e.g. Magee (2000) 276–8. ^ See e.g. Dahlhaus (1979). 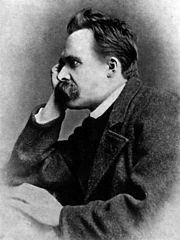 ^ Nietzsche (2009), III, 5. ^ See Magee (2000) 251–3. ^ Newman (1976) III, 8–9. ^ Newman (1976) IV, 542. This was equivalent at the time to about $37,500. ^ Millington (2001) 331–2, 409. The later essays and articles are reprinted in Wagner (1995e). ^ See Millington (2001) 286; Donington (1979) 128–30, 141, 210–2. ^ See e.g. Weiner (1997) 66–72. ^ Cosima Wagner (1978) II, 647. Entry of 28 March 1881. ^ Newman (1976) IV, 578. Letter from Wagner to the King of 19 September 1881. ^ "Richard Wagner Schriften (RWS). Historisch-kritische Gesamtausgabe" on the University of Würzburg website, accessed 29 October 2017. ^ See articles on these composers in The New Grove Dictionary of Music and Musicians; Grey (2008) 222–9; Deathridge (2008) 231–2. ^ Laibach website. Accessed 24 December 2012. ^ Cited in Magee (1988) 48. ^ Olivia Giovetti, "Silver Screen Wagner Vies for Oscar Gold", WQXR Operavore blog, 10 December 2011, accessed 15 April 2012. ^ François-Sappey (1991), p.198. Letter from Alkan to Hiller 31 January 1860. ^ Website of the International Association of Wagner Societies Archived 5 June 2011 at the Wayback Machine, accessed 1 February 2013. ^ See entries for these films at the Internet Movie Database (IMDb). ^ Management record Archived 28 January 2013 at the Wayback Machine at Bayreuth Festival website, accessed 26 January 2013. ^ Statutes of the Foundation (in German) Archived 17 October 2010 at the Wayback Machine at Bayreuth Festival website, accessed 26 January 2013. ^ See e.g. Gutman (1990) and Adorno (1989). ^ See Karlsson (2012) 35–52. ^ Carr (2007) 109–10. See also Field (1981). ^ See Potter (2008) passim. ^ Fackler (2007). See also the Music and the Holocaust website. ^ E.g. in Walsh (1992). Wagner, Richard (ed. and tr. Stewart Spencer and Barry Millington) (1987), Selected Letters of Richard Wagner, London: Dent. ISBN 0-460-04643-8; W.W. Norton and Company. ISBN 978-0-393-02500-2. Coleman, Jeremy (2017). "The Body in the Library", in The Wagner Journal, vol. 11 no. 1, 86–92. Everett, Derrick (2008), "Wagner, Gobineau and Parsifal: Gobineau as the inspiration for Parsifal", Monsalvat – The Parsifal Pages – site index page[permanent dead link], version of 26 June 2008, accessed 24 September 2017. Gregor-Dellin, Martin (1983), Richard Wagner – His Life, His Work, His Century, New York: Harcourt, Brace, Jovanovich. ISBN 978-0-15-177151-6. Gutman, Robert W. (1990), Wagner – The Man, His Mind and His Music, Orlando: Harvest Books. ISBN 978-0-15-677615-8. Körner, Hans (1984). "Der Bayerische Maximiliansorden für Wissenschaft und Kunst und seine Mitglieder". Zeitschrift für Bayerische Landesgeschichte (in German). 47: 299–398. Retrieved 26 February 2018. Sontag, Susan (1980). "Eye of the Storm", in The New York Review of Books, Volume XXVII, Number 2, 21 February 1980, pp. 36–43; reprinted as "Syberberg's Hitler" in Under the Sign of Saturn. New York: Farrar, Straus and Giroux, 1980, ISBN 978-0-86316-052-3, 137–65. Walsh, Michael (1992), "The Case of Wagner – Again", Time, 13 January 1992, accessed 17 July 2010. "Discovering Wagner". BBC Radio 3.